Check out our requirements below to see if your a good fit for camp! In order for you to get the most out of the Camp America programme and to have the best chance of being placed you must meet our set requirements. These also help us assess your suitability for the programme. Before you get started on your Camp America application, take a minute to check that you fit our requirements. If you're not sure about any of them or have any questions, then please get in touch! You must be 18 years or over before the 1st June of the summer you want to take part in. This is due to visa and insurance regulations that we must strictly follow. You can still start your application and be interviewed before you turn 18 though! You need to be able to depart for camp at some point between 1st May and 20th June. All of the camps we work with have different start dates, so we will only match your application to those camps that fit in with your availability date. The earlier you are available from though the better! If you’re applying for the Campower programme you must be in full time education. This is because a different type of visa is required for the Campower role. For the Counsellor programme, you DON’T have to be a student. You must complete and pass the relevant Police Check for the country in which your applying from. As you’re going to be working in an environment with children and vulnerable adults, it’s essential that you have a clear background check. You need to be fit and healthy enough to spend a whole summer working on a camp. We therefore require all participants to submit a Camp America medical form. This has to be completed by your doctor and will include a brief physical check up as well as your medical history. As you’re going to be working in America, you will need a J-1 Visa. This will mean completing online forms and attending a face to face interview at your nearest US Embassy. Camp America will give you all of the documents and support you need to get your visa., so we make it as easy as we possibly can for you. If you meet our basic requirements, my advice would be GO FOR IT! 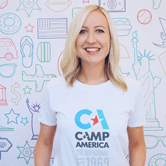 With so many different camps and positions available, Camp America are bound to find a placement to suit you! It's the best thing I ever did, so get on and apply. I guarantee you won't regret it! What if I don't meet all of these requirements? As we've mentioned above, you do need to be available to depart between 1st May and 20th June. Your online profile will let you put in the date that you're available on. The earlier you choose the better placement chances you'll have as we'll be able to match you to more camps. If your dates change once you've applied just let us know and we can switch this over for you. The medical form will not be issued to you until you're placed so you don't need to do it right away. The form has been designed by Camp America and is there to give us all of the information to make sure you will be safe and comfortbale on camp. There will be a medical section on your online profile initially, so please complete this accurately and honestly so that it matches your form when you get placed. Camp America will tell you how to apply for your police check and give you the necessary information you need. Typically the process for this will start at your interview with support from your interivewer, however it does depend on where you're from. Unfortunately even if you have a current police check when applyong we do need you to complete a new check through us as it's specific for summer camp work and theJ-1 Visa. Everyone who takes part in the Camp America programme must have a valid J-1 Visa that we will help you get. Once you're placed you will get some important visa papers from our US office that you must keep with your passport at all times. Once you have those you can book your appointment and Camp America will help you through every stage of that process.